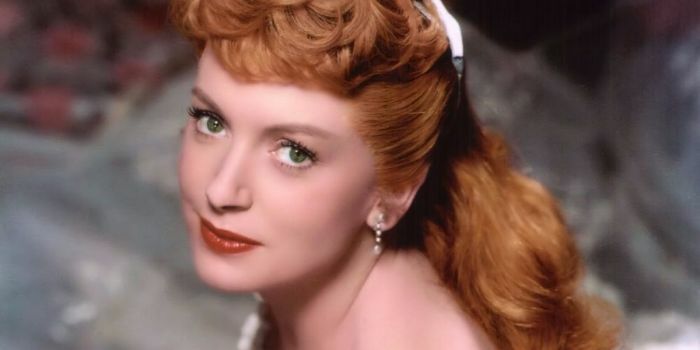 Deborah Kerr (1921 – 2007) is perhaps best remembered as portraying proper British ladies on the screen, but she had quite a range as an actress. She appeared in comedies, dramas, and musicals with ease. 1. Kerr first trained to be a ballet dancer. 2. Early in her career, she appeared in various walk-on parts in Shakespeare productions in London. 3. At 21 Kerr made her West End debut in Ellie Dunn, stealing the spotlight from established stage stars Edith Evans and Isabel Jeans. 4. Her career in film took off with the Michael Powell and Eric Pressburger production of The Life and Death of Colonel Blimp (1943) in which she played three women. 5. A starring role in another Powell Pressburger production, Black Narcissus (1947) brought Kerr to the attention of Hollywood. 6. Kerr’s first Hollywood role was in the film The Hucksters (1947) costarring Clark Gable with the tagline “Gable’s new star is Deborah Kerr,” in part to introduce American audiences to the pronunciation of Kerr—it rhymes with star! 7. Three times Kerr played a governess in popular films: The King and I (1956), The Innocents (1961), and The Chalk Garden (1964). 8. Kerr was nominated six times for Best Actress Academy Awards, but never won; she was awarded an honorary Oscar in 1994. 9. The actress starred with good friend Robert Mitchum in three films: Heaven Knows, Mr. Allison (1957), The Sundowners and The Grass is Greener (both 1960). 10. Kerr has a star on the Hollywood Walk of Fame at 1709 Vine Street.